In a month where we honor the legacy of one of the most extraordinary figures in American history — Dr. Martin Luther King, Jr. — I recently found myself dissecting a variety of his most infamous messages. There are obviously several Dr. King quotes that resonate globally, but the one that stood out to me as being specifically significant to today’s twenty-somethings dealt with faith. And that is a concept I believe to be foreign among this generation. “Faith is taking the first step even when you don’t see the whole staircase,” Dr. King once said. But what is faith, and why does it seem to be so nonexistent among the millennial culture? The concept of faith both begins and ends with belief. Believing that no matter the circumstance, one can achieve whatever it is they set their mind to. You see, faith is like an equation, where the formula is Faith = circumstance ÷ vision. Your circumstances don’t define you. They aren’t who you are, they’re what you’re faced with. But they can be broken down or divided with a vision; a vision of how one will overcome their roadblock of circumstances, and that vision is achieved by faith. More than ever we’re seeing present-day twenty-somethings break away from corporate and societal norms, in pursuit of revolutionary endeavors. Now, our predecessors may simply label it a rebellion, and that may be true, but I find it to be an intrinsic rebellion. Whether it’s dropping out of Harvard to build a globalized brand, or leaving Wall Street to found a pizza chain, these are occurrences that are rooted in faith. In my life, alone, there are a couple of individuals who have recently walked away from corporate ranks to embark on journeys that have transformed from once untamed dreams to now attainable goals. And like anyone, they will stumble along the way — as it was once said, “There can be no great victories in life, unless there’s tremendous adversity” — so it is the continuation of putting one foot in front of the other that will lead them to their destiny; a destiny manifested in faith. So to you I say, whatever it is in life that drives you, fuel it. Never let the uncertainty of what lies ahead deter you from claiming your destiny. 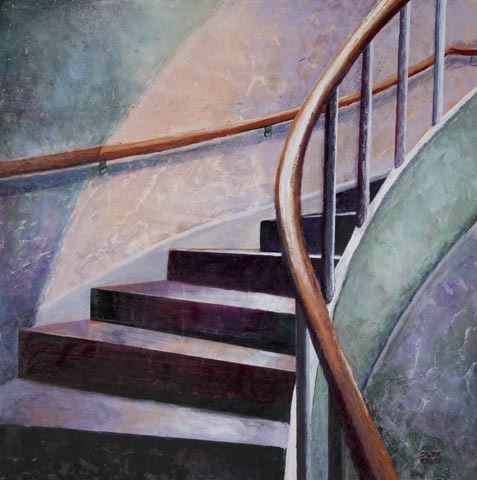 Grab ahold of the rail on your staircase of life and climb to the top. Although you may be your own worst enemy, never forget that you are your grandest champion. This entry was posted in 20-Something's, Signed Sirelle and tagged Faith, Faith is taking the first step even when you don't see the entire staircase., Martin Luther King Jr., twenty-somethings. Bookmark the permalink. Well-written. I think the loss of faith is unfortunately widespread. There is a loss of faith in religious terms. There is most definitely a loss of institutional faith, i.e. Wall Street, government, leaders of all types, etc. You make a great point in saying the restoration of faith has to begin with oneself.